Though they’ve been around since practically the dawn of the internet, podcasts only recently garnered widespread attention from the general public. Like most modern radio shows, listeners can tune in to their favorite on-air personalities whenever and however they want, thanks to technology. The difference with the standalone podcast is that, as a listener, you can really tap into specific and actionable advice that is slimmed down to your exact area of interest. 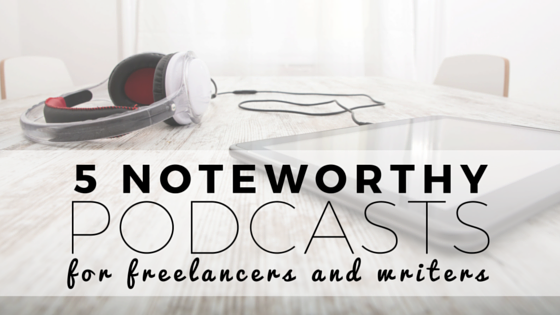 One of my favorite podcast niches is that for creatives (I covered my favorites for bloggers last week). The venue provides writers and makers a digital space to easily share experiences and insights with a like-minded audience. There are so many great ones out there. Here are five of my go-tos for the freelancer or writer. Unemployable is one of many eye-opening shows in the Rainmaker.FM arsenal. As stated in its intro, this podcast is for people who can get a job, but just aren’t inclined to take one. The host, Brian Clark, is a “habitual entrepreneur.” He draws from his 17 years of experience from rolling solo to creating eight successful businesses and acting as a CEO. This show is an exciting listen with smart strategies for freelancers, solo entrepreneurs, and startups. It provides real and actionable advice for improving your process, growing your business, and enjoying more freedom. Check out the Rainmaker.FM show index for more shows focused on storytelling in the digital age. Paul Jarvis is the talented voice behind The Freelancer. You may also know his name from his written work on sites like Huffington Post, Newsweek, and Fast Company. Jarvis calls himself a “freelancer evangelist” who aims to teach freelancers and other creatives how to up their game and make their business work on their own terms. These episodes are extremely consumable. They are short, fun, and ridiculously insightful. It’s a refreshing and rare peek inside the day-to-day of a successful freelancer. Whether you were an obsessive watcher of The Daily Show or not, Writer’s Bloc quickly may become one of your favorite resources for getting inside the minds of comedy’s wickedly creative class. The host of the show is J.R. Havlan, an eight-time Emmy Award-winning writer for The Daily Show with Jon Stewart. In his podcast, he picks the “complicated and jittery brains” of the writers who helped create The Daily Show, The Colbert Report, Inside Amy Schumer, and more. If you want to know how blank pages become the script of your favorite TV comedy, this is a must-listen. It’s absolutely ingenious and laugh-out-loud funny. Hosted by Jason Zook and The Freelancer’s Paul Jarvis, the show covers a wide range of topics that work to align your thinking with your journey. From tackling self-doubt, branding, customers, and zombies(! ), there’s something for every stage of the freelancer game. Between these two amazing hosts are about a zillion books and online courses, so you know these guys know what’s up when it comes to launching and maintaining a creative business. Longform is a weekly conversation between hosts Aaron Lammer, Max Linsky and Evan Ratliff, and a non-fiction writer guest. But, these guests are not your average reporters and writers. Each week appears another heavy hitter – some of the best in the business – sharing the behind-the-scenes of how they got their start and how they write stories. Expect to be impressed with insightful observations and advice about the craft of writing, much of which transcends journalism. Writers: Need help finding story ideas or connecting with expert sources? Let us know. PR Newswire for Journalists is your one-stop shop for newsgathering with access to custom newsfeeds, ProfNet expert queries and our multimedia gallery. Best of all, it’s free. Sign up at prnmedia.prnewswire.com or contact us to learn more.